Are you a good wich, or a bad wich? With all the sandwich shops out there ready to build your dream hoagie, it’s hard to know when you’re making wise nutritional choices. One way to save money and guarantee you’re sandwiching nutritional choices from crust to crust, is to make your own at home, but turkey and cheese with mustard can get boring pretty quickly. Here are a few heathy options (they’re also vegetarian), that will help you get protein, whole grains, and even fruit in between two slices without missing a single bit of the flavor you get from fancy breads and sauces at shops. I use Ezekiel bread for all of these. Always pick whole grain breads, and steer clear of those made using refined flour and sugar. Not all bread is created equal. The right decision can make or break your diet, and how your clothes fit. 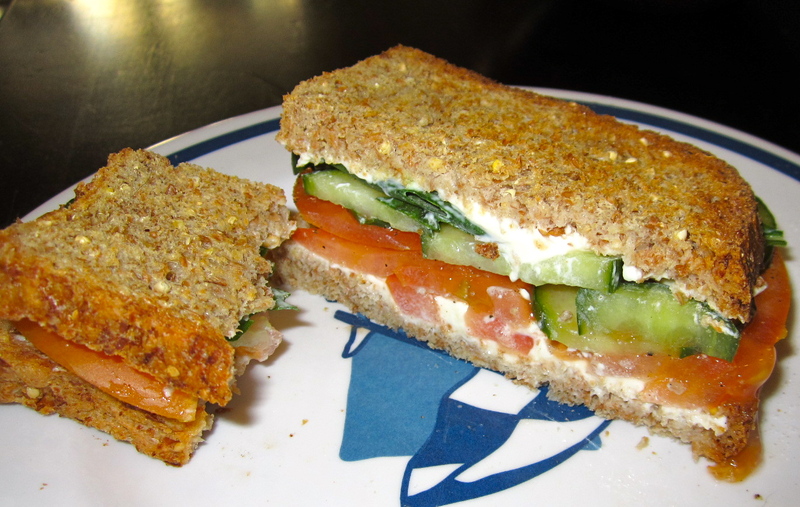 Healthy Cucumber Sandwiches – Laughing Cow cheese replaces cream cheese for a healthy swap. Spread one wedge of cheese on each slice of bread. Sprinkle tomatoes and cucumbers with vinegar, salt and pepper. Layer veggies on one piece of bread and top with basil. Put the top piece of toast on and enjoy! Peanut Butter and Berries – The berries add sweetness without using jelly, so you skip the added sugar. Spread peanut butter on one piece of toast, add berries, press, slice and enjoy. Grilled Apple and Cheese – Do not butter the slices. The cheese and apple will add all the flavor you need. Place one slice of bread on a sandwich grill, top with sliced apple and cheese, top with second slice, grill until cheese is melted.